Excavation and Removal of Asbestos Containing Soil, and Debris - Noreas Inc. 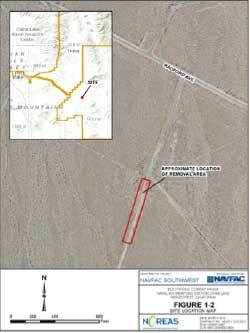 The project involved abatement of asbestos contaminated soil and debris areas adjacent to the road, north of the South Towers site at the Electronic Combat Range at Naval Air Weapons Station China Lake (NAWS-CL), Ridgecrest, California. The project involved preparing plans and specifications, excavation design; mobilization of equipment, materials, temporary facilities, and personnel, construction of soil stockpile containment areas; decontamination pad; installation of stormwater management provisions; personnel and area air monitoring; asbestos-containing material (ACM) debris collection; excavation of contaminated soils, grading, waste characterization; waste transportation and offsite disposal and site restoration. The project was conducted under the supervision of NOREAS’ Certified Asbestos Consultant / Certified Lead Base Paint Inspector and Assessor. During the removal of asbestos-contaminated soil and debris, area and personnel air monitoring were performed. Air sampling was performed for both asbestos fibers and total lead. At completion of the project, a total of 7660 bagged ACM debris and 710 tons of contaminated soil were transported off site for disposal.